Do you love Sweet Potatoes and Macaroons? This Makeover is a dish that combines the two into one. In our family we love both Sweet Potatoes and macaroons, so what better than to combine the taste of both into one dish? When I make Sweet Potatoes I always make an extra one. A leftover Sweet Potato is good for lunch or breakfast and it can be made into other dishes. 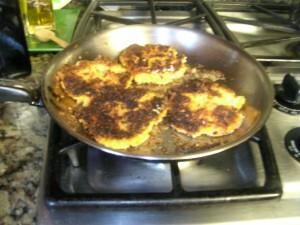 For this makeover we are going to make Sweet Potato Pancakes ‘breaded’ with Macaroon Coconut. Macaroon Coconut is very finely cut Coconut. It is so finely cut that it almost looks like confetti. Peel and mash the Sweet Potato and combine with the remaining ingredients. Mix well to incorporate everything into a homogenous mass. If the mixture seems too soft, you can add more starch to bind it together. Shape into patties, using a #30 food scoop or a heaping soup spoonful. You should have 4-6 croquettes. Put the Macaroon Coconut on a large platter or into a pie pan. Coat each patty generously with the coconut. The patties may be refrigerated before cooking. When ready to cook, heat some Olive Oil or Peanut Oil in a medium size skillet; when the Oil is hot (350 degrees), carefully place each patty in the pan. Cook until golden brown then carefully turn over each patty and cook on the other side. Drain on paper towels. Serve while still warm either with Maple Syrup or just by themselves as a side dish with your favorite meat such as pork, fish or chicken. The Sweet Potato Croquettes may also be made for breakfast along with some bacon or cooked ham. Other leftover vegetables can be used in this manner and may even be an incentive for the non-vegetable lover to eat their share. If you don’t want to make croquettes from your leftover Sweet Potato you can make muffins or even bread. Check our recipe section for a generic fruit bread recipe in which you can use any kind of fruit including the sweet potato. http://sylveeeskitchen.com/recipes/baked-goods/breads/fruit-muffins/ This recipe will work well as a quick bread or as muffins.